YORKSHIRE have set a new record for the most wins achieved in a County Championship season since the competition was split into two divisions in 2000. The hosts won their final match of the season against Sussex at Headingley by 100 runs to achieve their 11th victory of a famous campaign. Andrew Gale’s also set a new record for the most points by finishing on 286 from their 16 games. The previous best was 266 by Somerset in Division Two in 2007. Sussex were relegated by this defeat after Hampshire earlier beat Notts by eight wickets at Trent Bridge. Their cause looked hopeless when they resumed on 88-5 after lunch at Headingley, needing to bat out the final day to guarantee their First Division survival or else score 309 for an unlikely victory. MAIN MAN: Yorkshire's Jack Brooks. But the sixth-wicket pair of Michael Yardy and Ben Brown made the hosts work hard after the interval as they took the total to 142 before Yardy was out. 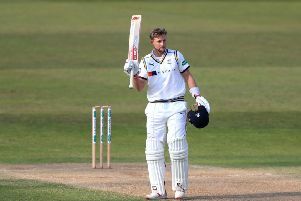 The former England left-hander, playing his last first-class match, top-edged an attempted hook off Tim Bresnan to Alex Lees at first slip to depart for 41. The Yorkshire players and umpires stood to applaud Yardy from the field after he had added 81 with Brown in 21 overs. Brown fell six runs later when Adil Rashid had him caught at short leg by Jack Leaning off the full face of the bat after making 42 from 66 balls. Sussex slipped to 154-8 when Rashid had Steve Magoffin lbw for three, and to 199-9 when Adam Lyth trapped Ashar Zaidi for an entertaining 47. Rashid rounded things off when he trapped Chris Liddle lbw for nought, with Sussex 208 all-out. Jack Brooks had earlier captured his 300th wicket in first-class cricket. The pace bowler took the first three wickets to fall after Yorkshire had opted to bat on this morning from their overnight 298-9. Tim Bresnan, 50 not out, added five to his tally before he lofted Steve Magoffin to Lewis Hatchett at mid-on. Bresnan fell to the ninth ball of the day and he finished with 849 Championship runs for the season at 49.94 - his best-ever return. Needing 309 to win, Sussex were quickly in distress. Brooks bowled Ed Joyce in the fourth over, the batsman chopping a full toss into his stumps. Brooks had Chris Jordan lbw for 20 and then captured his 300th wicket when Matt Machan was caught behind for 16, Sussex slipping to 39-3. Bresnan got in on the act by bowling Chris Nash for 17 and then had Luke Wright caught behind for two. At lunch, Michael Yardy is unbeaten on 15 in his final first-class innings, and Ben Brown has 16.